We can do large tree removal in the Kansas City area and all the way to simple clean up after a heavy storm. Either way KC Tree Care Service is your 1st choice to do the job. KC Tree Care Service crews are licensed and insured. We're a very hard working and respect your property like it was our own house. 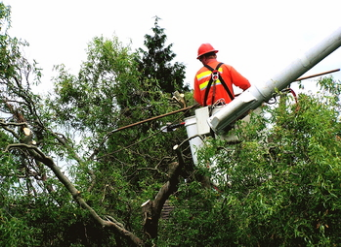 All of our crews are professional and follow the strict tree trimming and tree removal guide lines to ensure a proper job is done in the Kansas City area. At KC Tree Care Service our bread and butter is tree removal and tree trimming. We know cutting a tree down was probably the last thing on your mind and it can produce an unexpected bill. Unfortunately tree removal in the Kansas City area is unavoidable and there can by a number of reasons a tree must be taken down. These are just some of the most common reasons you might need to tree cut down. But if you are not sure we can send out an experts to check out your situation and give you a honest assessment of your situation and give you a bid of work that need to be performed. Tree trimming in the Kansas City metro could be needed for a variety of reasons. You have dead limbs that need to be removed or healthy branches are just hanging to low and need to be cut. By cutting unhealthy limbs or just clearing out space for the tree it can simply can add years to your trees life and relieve it from unneeded stress. Also cutting limbs will give you an opening in the canopy. By opening up the canopy this will allow sunlight to reach the ground and help with the grass to grow nice and thick versus thin and fragile. But again if you have any questions please call us and we will send one of our experts to give you a free evaluation of the service you recommend. 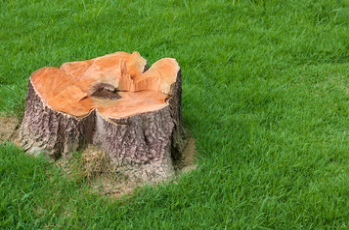 Stump grinding or stump removal is the 2nd part of the tree removal process if you choose to take it out. This is an extra option we can add at anytime during the process or for a later date. Stump removal is not a necessity in the tree removal process and is totally up you if you want it removed. If you decide to remove the stump we just need schedule an appoint with us and we will get it done with our special stump removal machine. Eventually stumps will rot as time goes one. Again we can wait years to get the trunk removed or we can do it same day. However cost is less while we are there because that is when all our equipment will be there to do it. OR you just removed a tree or you moved into a new house that has a stump present where the old tree stood. Now what?? You call KC Tree Service. Yes we will take that stump out. We take it out with a stump grinding machine. You don't want the stump anymore and it's and eye sore in your yard! Corrective Pruning - Most of the time a trees main limbs are weighted down with a bunch of smaller branches. By removing these small branches we can save your nicer and larger limbs. Deadwooding - What is deadwooding? What we do is go through the tree and remove any dead branches or limbs. This an important to do because a lot of dead wood is a good source food for insects and can attract disease that can harm the healthy part of the tree. Crown Raising -Is more of a strategic trimming of the trees. This is where we look at the tree and figure which limbs that we remove will give the tree possible stability and longevity. We found through our research is that the cost to remove a tree in the Kansas City area ranges from $465-$1500 or higher. There are a wide range of factor that play in the the tree removal cost. Such as history of the tree, is it straight or does it have some type o lean to it, multiple trunks, weak branches and is it in a decay state or rotten. Some other factors to consider would be the safety of the tree, is it near power lines or dangerous structures. Kansas City has some of the most amazing and well matured trees in the country. Because of this they are also extremely large and can easily reach heights above 100 ft which will cost a lot more. So above pricing is a good number to go off of don't be surprised if you have a 100 ft pin oak that costs more than the prices listed above. Tree Trimming/Cutting is a basic service where not as much work is involved and location. But a typical tree trim or cut can range from $250-$500 on average.